My week...my turn to share my fun block!!!!! 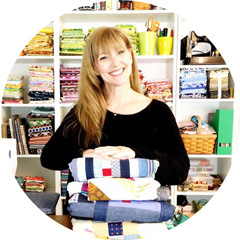 So happy to be here and many thanks and a shout out to Bree at My Crafty Crap, my Magic in the Middle friends at Pellon, and the gang at Free Quilt Patterns for organizing this fantabulous sew along!!!! You are some kinda wonderful!!!!! A new modern twist on a beautiful classic. This is a super easy and fun wonky funky shattered glass window. The block measures a 12.5in unfinished block. By using the traditional folding method that most of us are familiar with, it is an easy way to make a new favorite with very little extra effort. The lines are edgy and the colors bright to give the block a stained glass look. This block can be made without the border as a regular Cathedral window quilt and has a very different looking back compared to the traditional quilt. By using Pellon wonder under with craft fuse, it makes a great home dec project by giving the extra crispness to the fabric. Using Pellon wonder under and Legacy batting will give a softer finish for a quilt. Either way, it is a great project and I am very thrilled to be invited to play! Cathedral windows are mostly folding and ironing. Fold the corner over the edge of the template and iron into place. Then repeat on the other three sides. Done with the folding/ ironing part!!!! Make four more of these folded babies! Hand stitch the the inner centers, just a couple of stitches will do! This is how the back looks...I rather think is is SUPER COOL! Add your solid 1.25 in border, then play with your scrappy 1.5 in pieces then attach and your block is COMPLETED!!!!! Make sure to share your windows in the flickr group!!!!! I'm sold. This is really cool. I've stayed away from cathedral windows and now I have to try. Thanks for the inspiration. This is a great tutorial, love this block, so many possibilities of fabric. It's fabulous, Kim. Such a great twist on a classic. Enjoy the final stages of packing today, and HAVE FUN this weekend! Great tutorial and love the fabrics! Wow.. This is gorgeous! Not sure that I'm good enough yet but I'll add it to my Evernote for one day!! You make it look real easy. I'll let you know. My sewing is done in between nap times for my grand daughter, but still it is not like it was when I was a young mother.